Purists will appreciate this Potato Latke recipe no-frills ingredients: baking potatoes, eggs, salt, flour, olive oil and onions. Keep in mind that starchier potatoes produce crispier latkes. Serve a plateful of Hanukkah happiness with applesauce, sour cream or sugar. 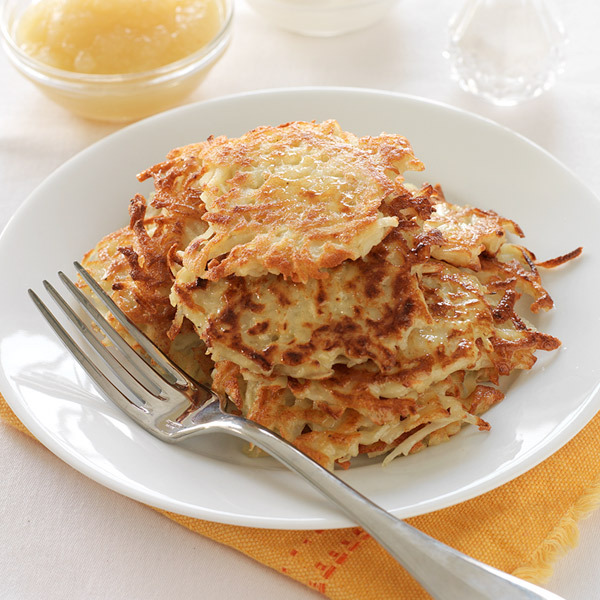 Another good reason to try this Potato Latke recipe: It easily doubles! Wash and peel the potatoes. Grate potatoes and transfer to large bowl of cold water to keep from browning. Drain well. Grate onions. Spread grated potatoes and onions onto a clean kitchen towel, and roll up jelly-roll style. Over sink, twist towel tightly to wring out as much liquid as possible. Transfer to mixing bowl, and add egg, salt and flour. Mix well. Place skillet on moderately high heat with enough oil to completely cover surface. When oil is hot, drop in spoonfuls of the latke mixture and flatten into 3-inch rounds. Cook until edges are brown. Flip and brown other side. Drain on paper towels—then arrange on wire rack. Add more oil to skillet as needed for each batch. Keep latkes warm in a 250°F oven, arranged on a wire rack set in a shallow baking pan.